I was starting to hate my job. It was the latter half of the school year. Spring Break was behind us. State testing was before us. I was dragging my students through lesson after lesson preparing them for the state writing exam. I was competing with Fortnite for their attention, and losing. Engagement was at an all-time low, and testing was coming at us at light speed. The thought of spending 84-minute periods struggling through whole-group lessons was making me dread every day. I have always had good rapport with my students, but no one is more disruptive than a seventh grader who has completely checked-out of your lesson. I needed a change and so did my students. I am no stranger to evolving as a teacher, as I discussed at great length in my post about ditching interactive notebooks. If something isn't working, change it. Immediately. I was always terrified to run stations in my classroom for several reasons. One, I am a total control freak, and the thought of students being left to their own devices to complete a task on the other side of the room confounded me, and two, I was afraid that my students would not be able to take responsibility and control their impulses. I imagined a classroom management disaster. Buuuuut if I had to spend one more day standing in front of 20 bored teenagers droning on about thesis statements, I was going to jump off of the balcony outside of my classroom. I was bored. If teaching ever stops being fun, stop what you are doing immediately, and make changes. I decided to stop whole-group instruction cold turkey. I ran my students through stations for the rest of the school year, and learned from that experience how to effectively run an entire class without ever doing a single whole-group lesson. The following school year, I began doing this the first week of school. As we all know, the first two weeks of school are the most critical time for classroom management. This is when you establish your routines and expectations, and teach students essentially how to navigate their way through your class. Stations are my normal. I see my students in small groups every day. My students tell me that my class is their favorite because they never get bored. I never get bored. I want to share some pointers for anyone who is either dragging themselves and their students through whole-group lessons, trying to use whatever collaborative strategies to make it less horrible and just counting down until Friday afternoon, or anyone who has been considering moving to a small-group station/rotation model and is a control freak like me and totally terrified to take the leap. 1. Set your physical classroom up in preparation. Decide where your stations are going to physically be. Where will you station yourself to work with a small group? Is it accessible to technology? Are all materials you may need nearby? Consider facing groups away from each other. This is my computer station in my classroom. Students face away from the front of the classroom. This is my "work with the teacher" station. Students sit at this table and we work on whatever lesson I would have otherwise give whole-group. We also work on targeting their specific needs (I group students according to data to ensure that I can target everyone's needs!). As you can see, I have a computer on the shelf at this station so that we can view videos or any other multi-media, and students copy Cornell Notes from the screen, etc. These two areas are for students to do independent reading. They are allowed to grab a pillow and sit wherever they want as long as they are not talking or disturbing others, and they must be reading the entire time. 2. Decide what your stations are going to be and make sure they are consistent. I have three stations - working with me, working on the computer, and independent reading. These never change. The computer website or program changes day-to-day, the lessons I do at my table change, but the stations themselves do not. 3. Decide how you want students to move from station to station. Decide on the traffic pattern. My students move counter-clockwise in my classroom to switch stations. The first week of school, we practiced moving around the room for an entire class period. It was time well spent because they can switch stations in under a minute without incident. 5. Plan plan plan. Running stations means having a lesson prepared every day for your small group, but also a plan for your other stations, whatever they might be. 6. Spend a week practicing with mini-lessons before diving head-first into content. This way, when you get to the content, students will already know what to do! 7. Reinforce expectations but don't spend the entire time yelling across the room because Steve won't stop talking while he's on the computer. Have a solid classroom management plan in place with PBIS to encourage students to follow your expectations. Make sure that students are aware of consequences for failure to comply with your expectations. 8. Let go of the control. At first, this might seem daunting an overwhelming - stick to it. Push through the growing pains of making this kind of change, and forge onward. You and your students will appreciate it. 9. It doesn't matter what your stations are as long as they are engaging, interactive, and sometimes fun. You can change the content of the stations up as often as you want, just try to maintain the delivery of the station (for example, at my computer station, students use different websites each day for different things, but the station of using the computer never changes). 10. Don't give up. It is going to be hard at first, but push through and constantly remind students about expectations. If they come to class acting crazy and not moving correctly around the room, or being disruptive at their station - stop class and spend time explicitly practicing expectations. Do not fight your way through every day! It does get better, and the better you get at consistently hold students to your expectation, the better it will be. If you have questions about how I use stations or implement them in my classroom, leave a comment! If you have any ideas that are working in your room - leave a comment! Also, if you are new here and have missed my Cornell Notes series - check it out! You can purchase my entire set of Cornell Notes for all middle grades ELA standards by clicking here. This is good food for thought. How big are your class sizes? How big are the groups? Do the same kids travel together each day from station to station? Our classes range from 36-38 kids on average. Could this work with a class that large? Wow, 38 in one class?? I can’t imagine!!! We have a class size law of 25. My classes are pretty small, less than 20 kids typically. I think you could still do this with that many kids, but teaching them the expectations and practicing them would be paramount for it to be successful. It might be rough at first but with consistency, it would run smoothly. You would probably also need more than 3 groups for sure! I would love to try this! How do you incorporate novels into stations? Students choose their own books. When they are at the independent reading station, they read for 20 minutes. So they’re getting 20 minutes a day in class to read. They just read as many books as they can, and then once per quarter, they complete a project for one of the books that they read. The project is choice-based, and they have to pick one and complete it. We also track how many books they read as a class and they earn prizes at different milestones, like a 50 books they get a pizza party, and if they read 200, we have a fancy luncheon with fancy food! Buy-in is enormous! They love it. Right now we’re 11 days in to the year and my one class has finished 7 books! What websites/computer activities are you doing? We use CommonLit a lot. We also use NewsELA, Quizlet to practice vocabulary (if you search Simpsk2 in quizlet, you can find all of my quiz sets, which are organized by standard! ), we also use typing.com to practice typing since our standardized tests are all on computers. I alternate to keep them interested. This is amazing, and a wonderful switch from the whole-class instruction that only ever benefits a couple of students. Kids today need to be mobile, active and moving around so you can hold onto their attention for like, 10 minutes at a time! I like this idea a lot so thank you! Do you think this could work in a class of 3rd graders? Their language abilities range greatly, and I also have a few rowdy students in my class who are often disruptive. What do you do with kids that did not earn enough points?? I make arrangements with another teacher and they go to another room and complete a reflection assignment and other assignments instead of participating. I’ve only had this happen a handful of times, though. I am a new follower, but so far, I've loved everything you've thrown out. I'm switching to CN in my class and use your PBS method as well. I have a few questions about these stations. 1. I teach Science and Social Studies (2 days each with a flex day on Friday). Our Science is very lab based, so it should be fine, but after 4 weeks of school my kids (and myself) are sick of reading the SS book and taking notes. I think stations might just be the ticket, but what are your thoughts? 2. You said in your small group with you they are taking their notes. I'm assuming CN, correct? How exactly are you delivering that? Are you going over it just as you would as a whole class? Are you giving everyone pre-filled in notes to make it go quicker (get it all in 20 minutes)? I may have more questions eventually, but I'm just excited to get started. I think rotations are great because they keep kids engaged for a length of time that is appropriate for their age. A kids attention span is equal to his age in minutes, so after so long you lose them! 20-25 minutes seems to be effective, and they appreciate being able to walk away from one station to go to another. It reduces behavior problems, too because kids tend to be more engaged. The downside is that there’s more planning involved because you have 3 stations per day. But instead of just reading the book and taking notes, you can create interactive lessons with the content also. I do CN in small group and use the sheets that are fill-in-the-blank. We can typically get through them and discuss no problem in 20 minutes. It allows me to better address student needs and questions also. Sounds great... divine even. Do you think group rotations can work in an art classroom? I usually do whole group instruction and then set them to task and circulate. We only have 50 minute periods. which is not enough! I think they can work in any classroom! 60 minute periods can be tough, but perhaps you could stretch the stations over 2 days, so maybe divide the class into 2 20-minute rotations with 10 minutes of “flex time” each day for all the other stuff that you have to do in a period plus a few minutes of time to switch stations/put things away etc. maybe have A day and B day and have 4 stations, so on A day they go to 2 stations and on B day they go to the other 2 stations. So in 4 days, students would visit 8 different stations. Then you have a 5th day each week for catching up, assessments, or whatever else you have to accomplish. Just a thought? This post really has my brain working overtime on how I can incorporate stations in my 30+ student middle school Family & Consumer Science classes! At your "work with the teacher" station, do you repeat the lesson with each group as they rotate to you? At my "work with the teacher" station, I just give the lesson, I don't do a lesson whole-group beforehand, so I'm giving the entire lesson in small groups. 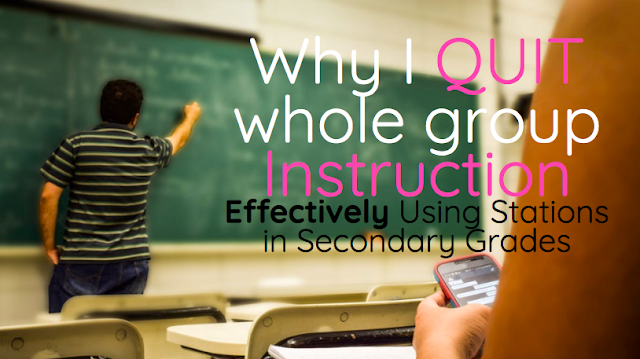 It allows me to chunk up the lesson and content more effectively and ensure that every student is undertanding. How would you go about setting up stations with limited technology? My school isn't 1 to 1...I could rent laptops but I can't do that everyday. Secondly, how does the computer stations work? Are they reviewing and completing activities from a previous lesson or the current days lesson? I'm just wondering how the students get started if they start at the computers before they get the 1 on 1 instruction with the new information for the day. Third, how do you plan for each day. Did you have to change your lesson structure or are you making more mini lessons to teach content? Super ideas! How do you monitor their typing progress? Do they fill out a sheet each time they do typing.com? I’m a science teacher and I’m interested in incorporating this into my routine mostly due to the high volume of students I have with adhd and reading deficiencies. I feel that doing more of this will help them stay engaged while allowing my higher learners to move more at their own pace instead of waiting patiently for others to finish when doing each of the station components as a whole group. Any other words of wisdom or things you’ve noticed since posting this originally that you could share with this first yr teacher? Fabulous! I, too, went strictly to station-based instruction and it works wonderfully! The students accomplish so much more, and it's never boring! Thank you for your insights!